KUALA LUMPUR, Dec 5 (Bernama) -- The High Court here today ordered that InventQjaya Sdn Bhd (IQJ) be wound-up for failure to pay RM240 million debts. Justice Datuk Abdul Wahab Ahmad made the order after allowing the government's winding-up petition against the company, which it (the government) claimed had breached a loan agreement entered by both parties. "l am satisfied this is a proper case for the winding-up order to be issued," Abdul Wahab said after completing hearing submissions made by Senior Federal Counsel Pretam Singh and counsel Wan Anuar Shadat for IQJ director and chief executive officer, Dr Sadeg Mustafa Faris. The judge also ordered that an official receiver be appointed as provisional liquidator. Earlier, the same court refused Dr Sadeg's application for a stay of execution on the winding-up order. IQJ is a collaborative effort between the government and a United States-based company, Reveo Inc, to undertake research and development to develop and commercialise frontier technology-based patents in Malaysia. Following the decision, the Insolvency Department will take over the management of InventQjaya. However, another counsel representing Dr Sadeg, S.N.Nair said that they would file an appeal against the decision and also apply for stay of execution of the winding up order. The Kuala Lumpur Sessions Court had on Jan 27 issued a warrant of arrest against Dr Sadeg after the prosecution could not serve on him three charges under the Anti-Money Laundering Act (AMLA) 2001. In Feb last year, police seized the company with an order under the AMLA. The seizure came in the wake of questions raised in relation to RM50 million belonging to the company being transferred out of the country. Two police reports were lodged over the matter. 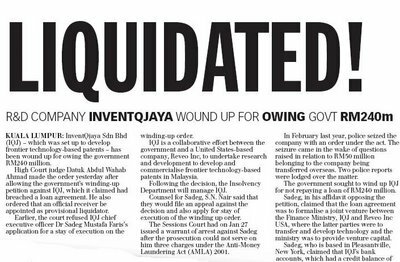 The government sought to wind-up IQJ for failure to repay an outstanding loan of RM240 million. Dr Sadeg, in his affidavit opposing the winding-up petition, claimed that the loan agreement was to formalise a joint venture between the Finance Ministry (MOF), IQJ and Reveo Inc USA, where the latter parties were to transfer and develop technology and MOF was to provide venture capital. Dr Sadeg who is based in Pleasantville, New York, claimed that IQJ's bank accounts, which had a credit balance of RM1,530,029.83 in cash and RM34 million in fixed deposits, had remained frozen despite the seizure order on the company being lifted. He alleged that IQJ was arbitrarily, deliberately and unlawfully put into its current position in a concerted effort to cause a breach of the terms of the loan agreement. Pretam Singh submitted that InventQjaya breached the loan agreement signed between the company and the Government on June 18, 2003, by failing to increase the paid-up capital and utilising a portion of the loan disbursed under the agreement to make advances amounting to RM553,464 to Reveo Bangalore, India. He said that there was nothing in Dr Sadeg's affidavit to show that he had settled all his debts after the notice under the Companies Act 1965 was served on him and also failed to put forward any evidence that the breaches had not been committed. Dr. Sadeg Faris, since graduating from U-C Berkeley with a doctorate in engineering in the seventies, Dr. Faris has secured more than 200 patents, with more than another 200 pending. Some of his innovations were developed during his early days with I-B-M. 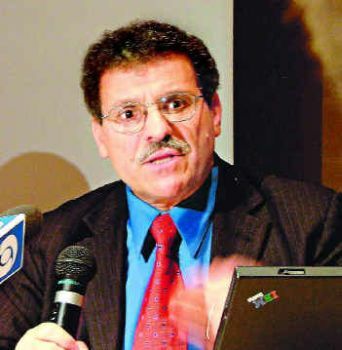 But by 1991, Dr. Faris struck out on his own and founded Reveo Inc. Its mission: to invent, develop and market revolutionary, frontier technology that solves problems for humanity. Dr. Faris calls it: Invent-q-bation. Some of his innovative works include the first low-cost solution to sea water de-salination, virtual curtains, and innovative energy using non-flammable metal fuel. Reveo and the Malaysian government have created Inventqjaya, Malaysia's premier R & D center. Launched at October 2004, the 25 million dollar initiative is part of the government's goal to achieve technology sovereignity by the year 2020. In an interview by CNN at 2004, it's revealed that Dr Mahathir was impressed by the achievements of Dr Sadeg, and invited him to continue his research at Cyberjaya. Dr. Mahathir visited New York on February 5, 2002. He admired the successes of the inventQbation results, and he said 'bring everything to Malaysia' and I said 'yes sir'. So that was the catalyst for the formation for InventQjaya. A leader who has been so inspiring, so sincere in helping this country and what he wanted me to do is consistent with our mission to help humanity, Malaysia's humanity, so why not come to Malaysia. The cooperation between InventQJaya and the Malaysian Government supposedly to strengthen the faith in Islam through the results of science. (Utusan) Prime Minister Datuk Seri Dr Mahathir Mohamad Saturday urged Muslims to study science not only because it is vital for their survival in today's world but also to strengthen their faith in Islam and Allah. "You must study science in order to survive, in order to protect ourselves, in order to match with others (non-Muslims), not to fight with them but actually to ensure that we are given a chance to survive as the others have survived," he said. Opening Malaysia's first mega research and development laboratory of the InventQjaya Sdn Bhd (IQJ) here, he said through the study of science, Muslims could strengthen their faith in Allah. Some of the achievements by InventQJaya can be found here, here and even patents are here and here. 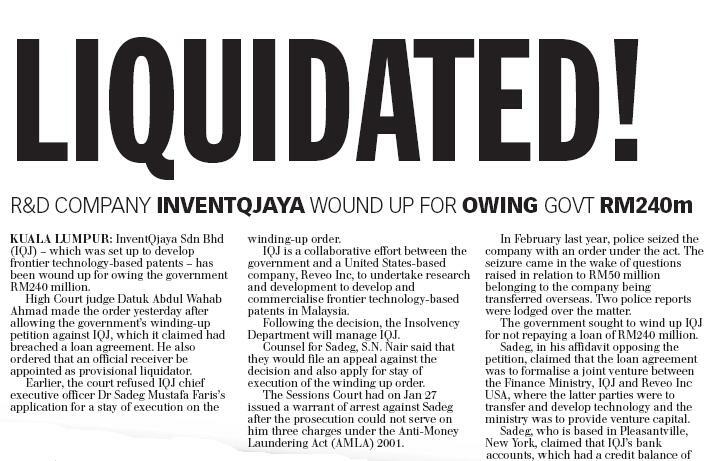 However after a year of research works at Cyberjaya, there was a probe into InventQjaya Sdn Bhd over the alleged illegal transfer of government funds by its chief executive officer. (Malaysia-Today) The Ministry of Finance (MoF) said yesterday that the probe follows allegations by a senior company official that the money, part of RM228 million (S$98 million) disbursed by the government, was transferred without the authorisation of its board of directors. 'A police report was made by a senior officer of InventQjaya alleging that there were some irregularities in the payments made by InventQ- jaya without the authorisation of the board of directors,' the ministry said. It did not mention the sum involved. The case is potentially embarrassing for the government which invited Dr Sadeg's company Reveo Inc (USA) in 2003 to invest in Malaysia's high-technology zone. Dr Sadeg, a Libyan-American, told CNN's TalkAsia host Lorraine Hahn in a programme aired in November last year that former premier Mahathir Mohamad had invited him to invest in Malaysia's Multimedia Super Corridor after a 2002 meeting in New York. The allegedly illegal transfer of funds raised questions on controls put in place by the government before disbursing millions of ringgit of public funds to a private company. 'People will ask how large sums are transferred out and they have the right to know,' said a senior official of a government technology company. The MoF said InventQjaya was a collaborative effort between the Malaysian government and Reveo Inc (USA). The firm's aim is to develop and commercialise patents that will enable Malaysia to become a developer of technology. The ministry also said InventQjaya is 100 per cent owned by Reveo Inc. The project is funded by a government loan of RM437 million, of which RM228 million has been paid out. InventQjaya said last April that it had 80 employees, including 20 scientists. It added that Dr Sadeg has filed claims to 200 technology patents. So what actually has happened? Based on the facts, this is a genuine researcher with alot of research results and patents. It's possible that the government got swindled by a smart person? I only feel sorry for the hundreds of engineers there who would potentially lose their jobs.